The trick to getting work done is to do it when you’re in a transitional period of your life. Right before I moved back to New York City, after living in Los Angeles for eight years, I got a facelift. Mind you, it was a stem-cell facelift done only by injection, with no knives involved, using my own fat and stem cells to rejuvenate my 39-year-old face — but it was “work” nonetheless, just like Botox, fat grafts, and any other non-surgical cosmetic procedure. Beverly Hills-based Dr. Nathan Newman promised me that it would look natural — and it did. So much so that when I returned to New York at 39, I came back looking more or less the way I had when I’d left at 31: the puffy under-eye bags that were beginning to engulf my entire face had disappeared, and I had the flush, supple cheeks of my youth. Apparently, the stem cells not only erased the lines but turned the clock back on my skin: I haven’t even had a blemish since the procedure. 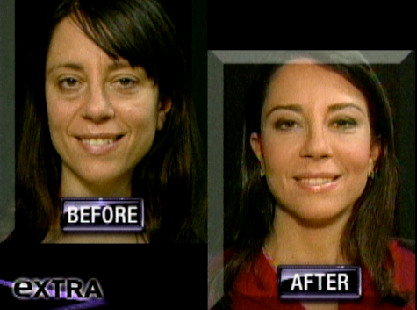 Author Amy Klein before and after her stem cell facelift. It’s been six years since my facelift, which amounted to 19 injections around my eyes, cheeks, mouth, and forehead. Since then, I got married — I’d returned to the Big Apple because I’d met someone — moved apartments, and most recently, had a baby after three years of fertility treatments. All rather stressful things, which usually take their toll on one’s visage. While I can’t say the same for my body, my rejuvenated face has held up. Most days, I forget I even had the procedure. When it really hits home is when I visit Los Angeles or meet someone who knew me then. “Wow! Marriage really agrees with you,” someone in LA said not long ago, looking at me quizzically. Airport security gave me the same look, trying to figure out how I looked younger than my passport picture, which was taken eight years prior. “I had work done,” I told the TSA guy, and he nodded, no stranger to the situation since he worked at Los Angeles Airport. She was wrong — I was much, much more tired with a newborn and an adorable snoring husband — but perusing old photos from my early to mid-thirties, you’d have thought I was up all night on cocaine benders. “Remember, I had that stem-cell facelift?” I told her. I couldn’t, in good conscience, let her think it was marriage and a kid that were improving my appearance. “Oh, right! I forgot,” she said, before asking me for the doctor’s number. It’s true that “cosmetic procedure” is not the first thing you’d think of when you see me — a jeans and t-shirt kind of gal who nowadays considers getting a bra on the sign of a successful morning. But I still want to look attractive, even though I don’t want to make a lot of effort to get there. I guess that’s why, over the years — especially since my facelift — I’ve changed my thinking about plastic surgery and other self-improvement efforts: I used to believe it was for the rich and famous, for the vain and superficial. Easy to say that when you’re young and wrinkle-free. I’ve come to realize that it’s good to take care of yourself, including how you look and how you age — within reason. That’s why I get gel manicures so my nails will last longer, a Brazilian blowout so my hair stays straight, and when I’m done having kids and breastfeeding, maybe I’ll have everything there put back into place, the way it used to be. And maybe, if there’s enough fat left over, I’ll get another stem cell face-lift. The stem cell facelift is a non-surgical facial rejuvenation procedure that harnesses the science of stem cells to make the body create more collagen. According to proponents of the procedure, this collagen leads to younger-looking skin. Formerly referred to as the Vampire Facelift, the stem cell facelift is minimally invasive, involving no incisions. As in other fat grafting procedures, the stem cell facelift starts by harvesting fat cells via liposuction from the stomach, thighs, or buttocks. The fat cells are then processed in a centrifuge in order to separate the platelets, producing a platelet-rich plasma (PRP) that is injected into targeted areas of the face. Many experts believe that the adult stem cells in PRP fat injections enhance tissue healing, lead to the growth of new blood vessels, and ultimately produce a more youthful glow. For these reasons, doctors offer stem cell treatments to fill in facial hollows, smooth out wrinkles, and improve the skin’s overall texture and tone. They claim that by doing so they are able to address issues caused by aging, exposure to the sun, and other environmental factors. However, stem cell therapies are largely unregulated by the FDA and have not yet been subject to rigorous testing. Stem cell facelifts are purported to be a good substitute for “maintenance procedures” such as Botox injections and injectable fillers. Unlike these injectable treatments, a stem cell facelift does not add volume. Instead, proponents say, it encourages the body to produce more collagen, in turn eliminating lines and wrinkles and producing natural-looking, subtle results that last up to two years. » Find out more about non-invasive facial rejuvenation procedures by using Zwivel’s directory to locate and contact cosmetic doctors in your area.